Without special handlers, it only works with an active debug connection going on. Without a debugger attached, the application blocks otherwise. The good news is that Segger supports with their debug probes a faster approach with what they name Real Time Terminal (RTT). And it even runs without a debugger attached to the board: all what I need is a Segger J-Link probe (or Segger J-Link OpenSDA) plus a telnet client. Similar to semihosting, RTT provides a bidirectional channel between the target and the host. This can be used for sending/receiving text and data. Have a look at https://www.segger.com/jlink-real-time-terminal.html to understand how RTT works. 💡 Currently RTT does not support file I/O what is now supported by the Segger Semihosting implementation. So I can send/receive data over communication channels with RTT, but there is no logic implemented to open/store files. Unless I would add a special RTT client on the host. There is a dedicated RTT channel for reading/writing to a file, but this is for a single file only. This is not enough to dump gcov trace and coverage data, as this would need multiple files. Maybe Segger will add generic file I/O in RTT in the future? The difference between RTT and normal semihosting is that RTT is handled at the probe level, and not at the debugger level. That makes RTT much, much faster. 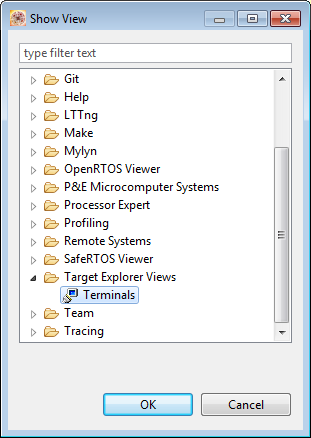 In the following I describe how to use RTT in an application. I’m using Kinetis Design Studio V3.0.0 with the Kinetis SDK, but the steps can be applied to any other environment. First, download the Segger RTT Implementation and example files from https://www.segger.com/jlink-real-time-terminal.html (Section “Example Code”). The Segger software package comes with several examples, including using VT100 terminal color codes or implementing a simple menu system. SEGGER_RTT_Read() Read data from an input buffer. SEGGER_RTT_Write() Write data to an output buffer. SEGGER_RTT_WriteString() Write a zero-terminated string to an output buffer. SEGGER_RTT_printf() Write a formatted string to an output buffer. SEGGER_RTT_GetKey() Get one character from input buffer 0. SEGGER_RTT_HasKey() Check if a character is available in input buffer 0. SEGGER_RTT_WaitKey() Wait for a character to be available in input buffer 0 and get it. SEGGER_RTT_ConfigUpBuffer() Configure an up (output) buffer. SEGGER_RTT_ConfigDownBuffer() Configure a down (input) buffer. SEGGER_RTT_Init() Initialize RTT Control Block structure when using RAM only targets. SEGGER_RTT_SetTerminal() Set the “virtual” Terminal to use for output on channel 0 via Write and WriteString. SEGGER_RTT_TerminalOut() Send a zero-terminated string via a “virtual” terminal. Of course it is possible to use any other telnet client. Using the Segger RTT is a better way than normal semihosting, as it is faster and more efficient to use. Yes, it does *not* hook into the normal standard library printf() stuff, but anyway, I want to avoid printf() wherever possible. Yes, it does not support generic file I/O yet, but at least it can read/write one log file. And yes, it depends on having a Segger J-Link or J-Link OpenSDA available. But it is a really cool and convenient feature for anyone using debug probes from Segger. I have put an example project for Kinetis Design Studio and GNU ARM Embedded (launchpad) tools on Segger RTT Example for FRDM-K64F on GitHub. This entry was posted in ARM, Boards, Building, CPU's, Debugging, Eclipse, Embedded, FRDM-K64F120M, Freescale, KDS, SDK, Tips & Tricks and tagged Building, Debugging, Eclipse, FRDM-K64F, freedom board, Freescale, Segger, software, software project, technology, Tips&Tricks by Erich Styger. Bookmark the permalink. New version of J-Link software? so it seems that the module with SEGGER_RTT_printf is not linked with your application? I have not seen any issues on my side. I am using the Makefile provided by the sample code in nRF5_SDK_11.0.0_89a8197, sample app: \nRF5_SDK\examples\ble_peripheral\ble_app_gls\pca10028\s130\armgcc, how are you using the linker ? I’m using Eclipse with the GNU ARM Embedded plugins and with the GNU ARM Embedded (lauchpad) GNU toolchain. Can you provide the linker command you are using ? Thanks, same as what we did, but the map file was still missing the symbol for SEGGER_RTT_printf. You did anything else to get it to work ? No, I did not do anything special. 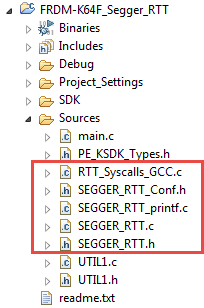 The function SEGGER_RTT_printf() is in SEGGER_RTT_printf.c. Can you check that you have this, and that you link this file? Segger might be able to answer this. From what I see is that the J-Link is checking and polling the target. but it keep refused to be connected. Could you plz tell me the phase to use other telnet program? 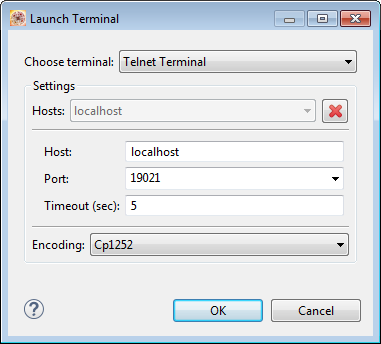 Are you sure you are connecting to telnet port 19021? the compiler messages seem to come from the fact that you don’t have the header file included in a proper way. Do I have to use that folder you are referring to? Because I’m using the files from the SEGGER installation. They are using the files from the Segger distribution. I still don’t understand. You say that the files on https://github.com/ErichStyger/mcuoneclipse/tree/master/Examples/KDS/FRDM-K64F120M/FRDM-K64F_Segger_RTT are from the segger distribution but I’ve just installed the j-link 5.12 and performed a beyond compare between the files and there are some important differences. Why are there differences? I mean, why the files found in the segger website are different than yours? I mean, why can’t I use the files from the j-link 512 installation? the files I have used in that project are the version 2.10 one. Later versions I have incorporated into the McuOnEclipse components, see https://mcuoneclipse.com/2016/04/03/mcuoneclipse-components-3-apr-2016-release/. Using the RTT component it gives me the option to have more up and down channels. I Tried to actually use another up channel (1), and just have the wordy debug prints going there, and using channel 0 for the shell interface, both up and down. But that still didn’t work. Have you used more than one up buffer for terminal output? I have used just one channel for terminal output so far, plus one for Segger SystemView and one for Percepio Trace (so a max of three channels). If you want to use your own channel, you have to configure it including the buffers: have a look how the initialization for SystemView and/or Percepio Trace is done. The number of e.g. 3 only sets up how many slots are available, but does not configure them directly. I was considering to extend this, but had no time (yet). Ah, I did some reading at Segger and all you have to do to get text to come out on one of the virtual terminals other than 0 is to use the RTT1_TerminalOut(1,sbuff); function with the first arg your virtual terminal and the second your string ptr. As I understand it, it is still going out on ‘up buffer 0’ so No need to mess with allocating buffers and stuff, and even bump the number of up and down channels is not needed. Ah, great! I did not realize that the same buffers could be used. We have another project going on that uses the LPC4088 so we can have a color LCD. We are using the latest LPCXpresso IDE and a Segger J-link. Will the code in this article work okay in the LPCXpresso IDE so we can get the debug prints to come out to a tera-term window or the J-link RTT viewer? Also, will we be able to use your processor expert components at all? Yes, that RTT code you can use with any IDE/environment as it is basically normal C code. RTT can be used with the Segger RTT viewers (GUI and command line version), or with a telnet connection (as outlined in this article). But not to a normal terminal program (unless it supports a telnet connection, like putty). You can use Processor Expert with LPCXpresso, see https://mcuoneclipse.com/2015/05/27/merging-nxp-lpcxpresso-ide-with-the-freescale-kinetis-design-studio-processor-expert-and-kinetis-sdk/. i find it a little bit troublesome that i have to connect the terminal session, every time i start a debug session. The same for the Segger System View , is there a way to automatically connect ? I have also the Problem that Segger System View (2.50 [FreeRTOS 9.0 ]) crash when i stop the debug session before stopping the recording. Do you have a solution for that or is that a problem with my configuration ? I’m not aware of a way to automatically connect. As for your problem with the Segger SystemView: I’m using 2.42 and I don’t see that problem (I have not installed 2.50). Have you reported that to SEGGER already? You might give V2.42 a try.